Celebrate Italian Cuisine Day With Wine and Risotto! Saturday, January 17th is International Italian Cuisine day. 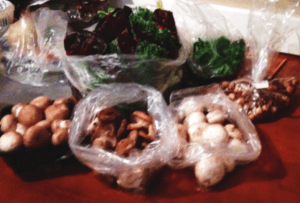 I thought we should blog about great food from the “old country”. While there are tons of great Italian dishes out there, I have been craving that specialty of northern Italy, risotto. Traditionally served as a first course, this creamy and delicious rice dish can work as a satisfying entrée. Risotto can range in variety from the exotic Risotto Milanese, which is enriched with saffron, to light and delicate seafood riosotto, to the dark and dusky risotto al Barolo. Regardless of the condiment or flavoring, great risotto begins with great rice. You need a short grain rice which is high in starch content. Arborio or carnaroli varieties are readily available in most grocery stores. It is well worth the effort to search for a specialty store that carries the vialone nano variety. The next important trick to great risotto is mastering the method. 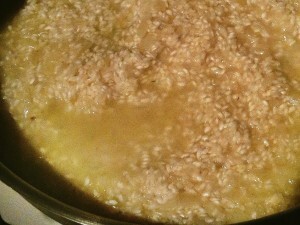 Instead of steaming, risotto is made by the timely addition of broth or water. There are 2 tricks to this… First, make sure that the liquid and the cooking rice are at the same simmering temperature. Secondly, gently stir the liquid into the rice, and only stir as much as you need to. If the grains break, your risotto will become gummy and pasty. In a sauce pan, bring the broth to a simmer. Make sure that it is close to the pan where you are making the risotto. Heat a heavy-bottomed sauté pan that has high sides (2” or so) and add the olive oil and 1 tablespoon of butter. Add the onion and cook gently until the onion is translucent. Add the rice to the sauté pan and stir gently so that all the grains are coated with the butter and oil. Now you will begin adding the broth from the sauce pan to the sauté pan one ladle at a time, stirring with a wooden spoon to make sure that the rice does not stick to the bottom of the pan. When the rice absorbs one ladle of broth, add another ladle of broth. Repeat this process until the rice is tender but al dente. It should take about 20-25 minutes and the rice will look moist and creamy, not runny. When there is about a minute or 2 to go, add the remaining 2 tablespoons of butter. Remove the pan from heat and add all of the cheese, folding gently in order to even distribute. White Truffle Risotto: Shave a half ounce of white truffle all over the top of the risotto right before serving. For those of us like me who are on a budget, you can always drizzle a bit of white truffle oil over the top. Mushroom Risotto: In a separate pan, sauté about a pound of your favorite mushrooms in some butter and olive oil. I add a clove or 2 of garlic and some salt and pepper to taste. I deglaze the pan with a bit of wine and continue to cook until the mixture is dry. Before I add the butter and cheese to the risotto, I stir in about half of the mushroom mixture. 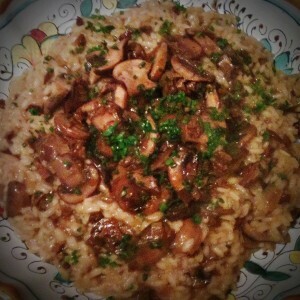 I pour the finished risotto into a platter, top with the remaining mushrooms and chopped chives. Butternut Squash Risotto: Cook and finely dice some butternut squash, about 2-3 cups. Instead of adding that last ladle of broth, add a ladle of heated heavy cream and fold in half of the squash. Finish the risotto with the butter and cheese. Top the finished risotto with the rest of the squash and some fried sage leaves.